Woo-woo jumps on the hair analysis drug testing bandwagon. When ignorance is not bliss and alternative medicine just won’t quit. Science under siege – the (deliberate?) hijacking of real science by alternative medicine. 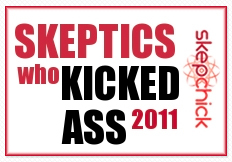 The Skeptic Zone hits number 1 on iTunes Australia, outranking Oprah and SGU! ?